The new SCOPIC brand and website is dedicated to masterbatches and compounds which impart detectable qualities to plastic and rubber products. Metal and X-Ray detectable products are used widely throughout the food and pharmaceutical industries, where any detached fragments can be identified should they reach the production line. Typically, these are smaller products such as pens, clipboards and spatulas, but can also extend to pallets, conveyor belting and crates. Detectability can be achieved throughout the polymer down to a few millimetres. 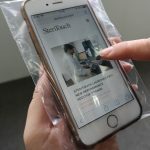 With in-house production and testing facilities onsite, SteriTouch was able to develop a completely unique offering, including the development of combined antimicrobial/detectable compounds not seen before. These are designed for hygienic environments where both foreign body and bacterial contamination could be an issue. To benefit the food production industry, the company has also recently had metal and X-Ray detectable blue masterbatches in a polypropylene carrier approved for food contact. Having moved premises in late 2017, SteriTouch is now based in a large industrial unit in the South Wales Valleys, where it has further expanded its R&D and production capabilities. The factory is now home to several extruders and injection moulders, along with an extensive technical testing laboratory. 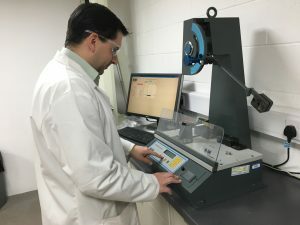 Tensile and impact testing can be performed on unfilled and detectable compounds to confirm the effect of the additive, while detectability can be checked on a Safeline balanced coil metal detector. An extrusion plastometer has also been installed, which has enabled SteriTouch to formulate a metal detectable masterbatch with excellent flow properties, overcoming a common issue with melt flow in detectable materials. Extreme temperatures or sustained exposure to UV can affect the performance or aesthetics of any product, and not just the colour or tensile strength. Environmental weathering stations including a QUV and Atlas Suntest are in place at the site to replicate conditions such as humidity or high UV, which can degrade any plastic product. Additives can be reformulated to improve the original properties, and further antimicrobial or strength testing will ensure a robust end material. The second new product in the portfolio is branded Konduct, which represents a range of performance additives for thermal management challenges.